Gorgeous Centrally Located Colorado Springs Vacation Rental, mountain view, putting green and Frisbee golf. Look no further! Welcome to your vacation rental hot spot! This large 2700 sq/ft home boasts an open concept with large living areas, 5 bed and 3 baths! 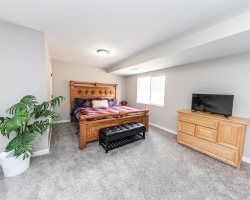 You won't find a better location with in minutes to UCCS, GOD's, downtown Colorado Springs, Manitou Springs and much more! Do you like to golf? Practice on the new putting green or challenge your friends to a game of Frisbee Golf! On one of our many gorgeous Colorado Summer days, relax on one of the many outdoor spaces, grill some food, have a cocktail and enjoy the gorgeous view of Pikes Peak! You will love the large open indoor space! Bright, great views and plenty of room to spread out and relax in on of the many living rooms! Cook a few meals in the well stocked kitchen, while gazing out at the beauty of Pikes Peak, plenty of dining spaces at one of two tables and at the counter top bar. Go down to the lower level and there are 2 more bedrooms, a living room area with a wood fire place and a game room for the younger kiddos. Have a larger group of people traveling with you? No problem, we have more homes right next door that sleep between 14-16 each!